Pioneers in the industry, we offer Vial Powder Filling Machine such as Injectable Powder Filling Machine, Single Wheel Vial Powder Filling Machine and Double Wheel Vial Powder Filling Machine from India. Gained prominence in the industry as a manufacturer, supplier and exporter, we are engrossed in offering Powder Filling Machine. Available in different specifications, these machines are manufactured in tandem with the international quality standards. After production, these machines are checked for functionality and performance to ensure flawlessness. 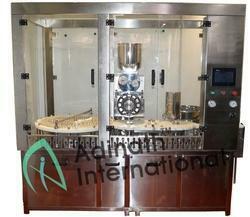 Dry Injection Powder Filling Machine is suitable to fill injectable powder into vials. The precision built welded steel frame is encompassed with stainless steel sheets with access doors for servicing the machine. All parts coming in contact with container, powder and rubber stopper or exposed to the atmosphere are made of stainless steel for long life. 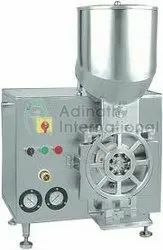 The sterilized powder is stored in powder hopper is agitated by pair of mechanical agitators for maintaining consistency and uniform bulk density. The powder wheel having eight ports rotates at the pre determined speed below the powder hopper with practically no clearance. Powder wheel consist of Piston in each port and behind the powder wheel vacuum plate is provided there is no clearance between powder wheel and vacuum plate due to back spring pressure. Precise volume of powder is sucked in to the port of powder wheel during vacuum according to the piston length different fill size can be achieved. The excess powder is doctored off by a doctor blade. Doctor blades can be adjusted from outside also without removing powder hopper. When powder wheel indexes further and remain in the port due to the vacuum till it reaches just vertically above the container. The time dose of Compressed air (Nitrogen Gas), sterilized low pressure air sequentially flushes out powder from the port of powder wheel in to the container one by one. Fill Capacity 50 mg. to 1.5 gms with the help of change parts. Automatic Injectable Powder Filling Machine is suitable to fill injectable powder into vials. The precision built welded steel frame is encompassed with stainless steel sheets with access doors for servicing the machine. All parts coming in contact with container, powder and rubber stopper or exposed to the atmosphere are made of stainless steel for long life. Sterile Powder Filling Machine is suitable to fill injectable powder into vials. The precision built welded steel frame is encompassed with stainless steel sheets with access doors for servicing the machine. All parts coming in contact with container, powder and rubber stopper or exposed to the atmosphere are made of stainless steel for long life. 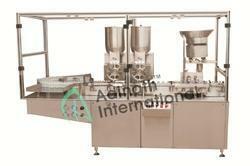 Aseptic Powder Filling Machine is suitable to fill injectable powder into vials. The precision built welded steel frame is encompassed with stainless steel sheets with access doors for servicing the machine. All parts coming in contact with container, powder and rubber stopper or exposed to the atmosphere are made of stainless steel for long life. 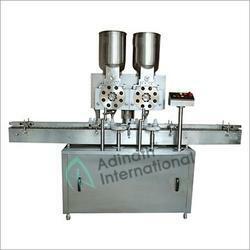 Double Wheel Powder Filling Machine is suitable to fill sterile powder into vials. The precision built welded steel frame is encompassed with stainless steel sheets with access doors for servicing the machine. All parts coming in contact with container, powder and rubber stopper or exposed to the atmosphere are made of stainless steel for long life. “No Vial, No Filling” system eliminates wastage of costly powder. High Volumetric Filling Accuracy of ±1% of uniform density Injectable powder can be ensured by setting the depth of piston in the port of powder wheel. Fill Capacity 50 mg. to 1.5 gms with the help of change parts. Up to 6 gms filling by multiple dosing. Vial Powder Filling & Pluging Machine is suitable to fill injectable powder into vials. The precision built welded steel frame is encompassed with stainless steel sheets with access doors for servicing the machine. All parts coming in contact with container, powder and rubber stopper or exposed to the atmosphere are made of stainless steel for long life. Automatic Vial Powder Filling & Stoppering Machine is suitable to fill injectable powder into vials. The precision built welded steel frame is encompassed with stainless steel sheets with access doors for servicing the machine. All parts coming in contact with container, powder and rubber stopper or exposed to the atmosphere are made of stainless steel for long life. 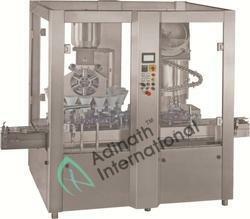 Pharma Powder Filling Machine is suitable to fill sterile powder into vials. The precision built welded steel frame is encompassed with stainless steel sheets with access doors for servicing the machine. All parts coming in contact with container, powder and rubber stopper or exposed to the atmosphere are made of stainless steel for long life. 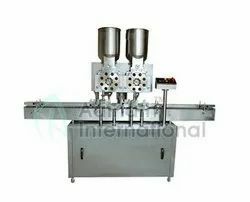 Injectable Powder Filling Machine is suitable to fill sterile powder into vials. The precision built welded steel frame is encompassed with stainless steel sheets with access doors for servicing the machine. All parts coming in contact with container, powder and rubber stopper or exposed to the atmosphere are made of stainless steel for long life.